The Tru-Flate Wall-Mounted Tire Inflator part # 16-250 must be used with a flow-through air chuck as the shutoff valve is inside the compressor and not in the air chuck. The Tru-Flate Wall-Mounted Tire Inflator - 110 psi - 120 Volts # 16-250 has a standard tire valve size fitting coming out the bottom where the coil hose attaches. The other end of the hose has a 1/4 inch male NTP fitting and then the valve assembly. If your wall mounted air compressor hose fits either of these fittings, then you can absolutely use it. If you were to set the Tru-Flate Wall-Mounted Tire Inflator # 16-250 to 32 psi it would inflate the tires to exactly 32 psi. It is very accurate. 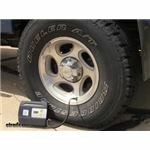 Yes, the Tru-Flate Deluxe Digital Compact Tire Inflator w/ LED Light # 16-235 that you referenced can be used with trailer tires. It can handle up to 100 psi so as long as you don't have to inflate the tires over that figure you'd be fine. 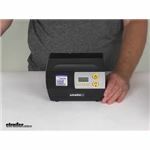 The Tru-Flate Deluxe Digital Compact Tire Inflator w/ LED Light # 16-235 that you referenced would have no problem inflating a tire from 50 psi to 80 psi like you mentioned. This compressor is capable of inflating up to 100 psi so to go from 50 to 80 psi would not be a problem. 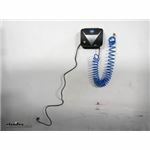 Yes, I attached a link to this page that details how to install and use the Tru-Flate Wall-Mounted Tire Inflator # 16-250 you referenced. It shows how to properly connect the air chuck to the valve stem as well as set tire pressure etc.